Decay on tooth surfaces that are next to each other (proximal surfaces) is common. Usually it has not progressed into late stages of decay and the tooth surface does not yet have a cavity. Different methods are used to manage proximal dental decay. 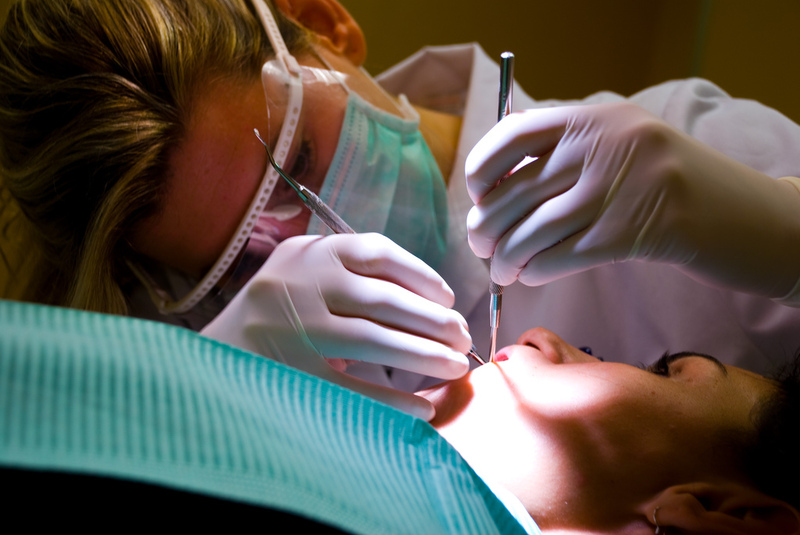 A common method is drilling the affected tooth tissue and inserting a plastic or metal filling. However, a lot of sound tissue can be removed in the process and this method is regarded as invasive). Another non-invasive methods in use include dental practitioners applying fluoride varnish or advising people to floss regularly. These non-invasive methods do not require removing any tooth tissue. More recent approaches (micro-invasive treatments) involve preparing (conditioning) the tooth surface with an acid and then either placing a sealing (cover) on top of the surface or ‘infiltrating’ the softer demineralised tissue with resins. These newer methods work by installing a barrier either on the tooth surface or within the demineralised tissue to protect it against acids and avoid the further loss of minerals from within the tooth. This, in theory, should stop the decay. This approach can be performed by a dentist or other dental practitioner and involves the loss of a few micrometers of tooth tissue because of the need to condition the tooth surface with acid. There is still uncertainty as to how effective micro-invasive treatments are for managing proximal decay. It is also unclear which if any of these techniques are better than others. For example, a stronger acid is needed to infiltrated porous tissue with resin than when the tooth surface is simply sealed or covered. While infiltration might be a more effective method of protecting the tissue than sealing it, the use of a stronger acid also means losing more tissue. The aim of this review was to investigate the best approach for managing such decay in adults and children. A systematic review of the evidence to evaluate the effects of micro-invasive treatments in the management of tooth decay on adjacent (proximal) teeth in children and adults (primary and permanent teeth). The research was conducted by a team led by Mojtaba Dorri from the Bristol Oral and Dental School, on behalf of the Cochrane Oral Health Group. Stephen M. Dunne, Tanya Walsh and Falk Schwendicke were also on the team. Data was extracted from 8 randomised controlled trials. A total of 365 people participated in the trials, and were randomly assigned to different micro-invasive and non-invasive treatments. There were no studies comparing micro-invasive interventions with invasive treatment (fillings). Four studies received financial support from intervention inventors or manufacturers to carry out the research. The current evidence shows that micro-invasive treatments can significantly reduce the likelihood of dental decay progression compared with the described non-invasive methods. There are too few studies to decide which micro-invasive treatment technique is best or the impact of different clinical and patient considerations. No negative side effects were reported; however, only half of the studies measured this outcome and the follow-up time of some of the studies was relatively short. Although further research could possibly change our findings, the available evidence gives us moderate confidence that micro-invasive treatments are much more effective than non-invasive treatments for stopping tooth decay. Overall, dentists can consider micro-invasive treatments a viable option for treating non-cavitated proximal lesions, taking into account clinical indication and the feasibility of different techniques. Based on the described limitations in the validity and applicability of current evidence, future trials should aim at reducing risk of bias (i.e. increasing internal validity) by aiming to effectively blind participants and outcome assessors. It may not be possible to carry out a placebo-controlled trial. Pragmatic, practice-based studies, with independent non-industrial funding and independent outcome data assessment and reporting, might be suitable to further address the risks of industry and profession bias. Future trials should use a standardised set of outcome measures, defined a priori according to their relevance in clinical decision-making. Thus, trials should not only measure efficacy (i.e. lesion arrest), but also applicability, time- and cost-related outcomes, and outcomes subjectively reported by participants or dentists. Ideally, studies should have sufficient sample sizes and follow-up to allow detection of late or adverse events, within primary care settings and in real-life populations to ensure external validity. Such trials should be suited to explore the impact of tooth-, participant- and dentist-level confounders on the efficacy of proximal sealing. Dorri M, Dunne SM, Walsh T, Schwendicke F. Micro-invasive interventions for managing proximal dental decay in primary and permanent teeth. Cochrane Database of Systematic Reviews 2015, Issue 11. Art. No. : CD010431. DOI: 10.1002/14651858.CD010431.pub2. This entry was posted in Caries, Restorative dentistry and tagged Caries, dental decay, micro-invasive, proximal decay, resin, sealing, tooth decay by cochraneohg. Bookmark the permalink.